Montella’s comparing this summer’s player purchases as “a new wardrobe” and then, ahead of his 15 th competitive match this season, admitting he still needed to find “which trousers go with which socks” was completely unnerving. Fourteen games played, and he still had no idea who his best eleven were. Unbelievable. It was even more unnerving than his formation choices and reasoning. But amidst all of this is the complete mystery of how he chooses his attack. Not just by formation, but by performances and goals scored. And the fewer goals we score, the more flustered and bizarre his choices seem to be. It’s like he’s having a panic attack. Let’s preface this conversation by pointing out that while management talked about getting a world class striker this summer, Montella kept begging for Kalinic. And in the end, that’s who he got. An overpriced striker who, last year or the year before, could have made an impact for us, but this year does not stand out amongst the players we already have. Plus, injuries. But when he’s healthy, he gets the start. Every time, regardless of formation, other strikers, other players, whatever. I’m beginning to wonder if he’s related to Montella or something. Or take Suso, for example. The only consistent starter who didn’t fit into Montella’s coveted 3-5-2 formation. Despite not being the most clinical and being played out of position most of the season, he is our highest scorer to date. Or Borini, also played consistently and out of position, is even less clinical, and is our lowest scoring attacker/right wingback/wherever Montella plays him, but joint-highest in assists. Or Calhanoglu, whom Montella regularly insists has some emotional issue or another and is heavily criticized, ends up getting the start more often than not, and his stats are actually decent, especially those assists. How does any of it make sense? Why are the most suppressed players performing the best? And how is it still obvious that he is not getting the best out of any of them? Milan have failed to score at all in six of their first 20 competitive matches. We’ve lost five of our opening Serie A matches. We need goals. 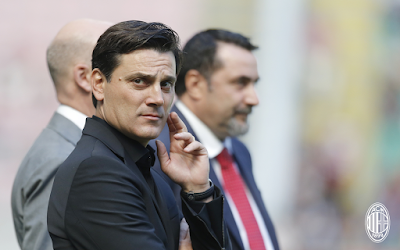 But while Montella tries to figure out how to dress himself, the goals come more sparingly. Not just because he’s playing the wrong system, but also the wrong players. Let’s have a look at the stats. This table lists every competitive match by date, score, and formation. The starting attackers are listed as well as who scored the goals in each match. If Montella needs some fashion advice, maybe he could just look at what worked best. Performance-wise, the combo of Silva and Kalinic at the top was by far the best to watch. And the three matches that he lined those two up, we scored seven goals in two of the matches (including a Silva hat trick,) but were still held scoreless against Roma. 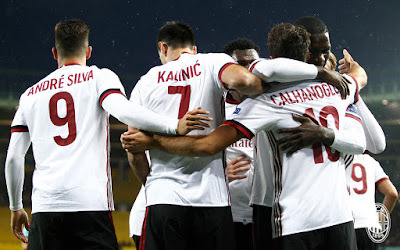 Silva and Cutrone have five goals a piece, but only eight and seven starts respectively, the fewest of all of the strikers. But played together, they haven’t had the best luck. And he hasn’t even tried a Kalinic-Cutrone combo, maybe they would be even better? Who knows? It’s not rocket science, just grab the trousers and socks that work together. Montella’s sitting on a gold mine of young talent. Well, and Borini. Any or all of Cutrone, Silva, and Suso could light the pitch on fire with goal after goal. But he’s not playing them all, and when he does, he handicaps them with strikers that are too much alike or with a midfield that can’t get the ball forward. Imagine what Suso could do if Montella would play a different system? It absolutely seems as if he’s hobbled them and is keeping fans from enjoying the performances as well as the results that are right there in his closet. For me, the data shows inexplicably that Montella does not know what he is doing tactically. The onset of the 3-5-2 formation when performances, wins, and especially goals deteriorated overall, in Serie A especially. But it also shows that Montella really cannot figure out how to dress himself. In attack alone, he literally cannot see what the rest of us can – who his best striker pairings are and which players are the most clinical. It’s no surprise, then, that he’s been tiptoeing the fine line between Milan manager and unemployment. And if he does get sacked, he’ll have no one else but himself to blame. Maybe it’s not fashion advice he needs after all. Maybe he just needs some sort of medical treatment for all of his panic attacks.